Pan American Airways Corporation Issued To And Signed On Verso By Powel Crosley, Jr 1937, Delaware. 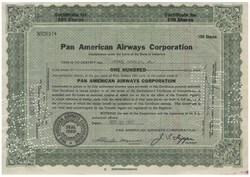 Stock certificate for 100 shares of Pan American Airways Corp. Green/Black. Facsimilie signature of Juan Trippe as president. Very fine condition. Perf cancellations not affecting Crosley's signature. Powel Crosley, Jr. (September 18, 1886 � March 28, 1961) was an American inventor, industrialist, and entrepreneur. He and his brother Lewis were responsible for many "firsts" in consumer products and broadcasting. He was the builder of the Crosley automobiles. He was the owner of the Cincinnati Reds major league baseball team for many years. Crosley Field, a stadium in Cincinnati, Ohio, was renamed for him. The street-level main entrance to Great American Ball Park in Cincinnati is named Crosley Terrace in his honor.